Words Matter. Right Now, Not Mine. 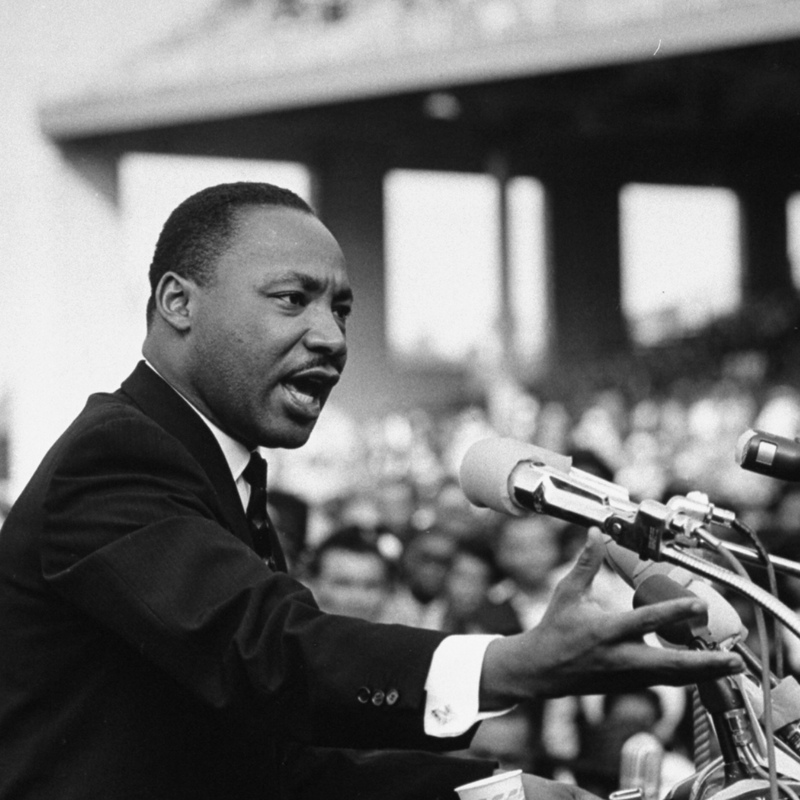 The Legacy of MLK, Jr. and Amplifying the Voices of People of Color. The life, words, and example of Martin Luther King, Jr. matter, and, not unlike Jesus Christ, not a diminished, sanitized, coopted version, either. MLK was a visionary, a revolutionary, a justice-monger, and a pot-stirrer. He sided with people who were powerless, poor, disenfranchised, and marginalized. He was mocked, criticized, and, ultimately, violently slaughtered. It’s popular and pretty to share our favorite quotes by MLK, Jr. in January every year. It’s not very popular to recognize, as a white person, my culpability in supporting the racial power paradigm that persists in America. The truth is sickening and uncomfortable, but it’s the truth nevertheless: if I’m not standing up for justice today, I would not have stood up for justice then. If I’m not marching now, I would not have marched then. If I’m not making the complacent and corrupt in power uncomfortable— and afraid that I will fight tooth and nail with increasing masses to unseat them— then I’m following neither MLK’s example, nor Christ’s. And words matter in the fight for equality and justice. If they didn’t, people would quit telling us to shut up. But my words matter only as much as the words of my brothers and sisters — and, frankly, my words matter less than those who experience the deepest cuts and most terrible effects of racism in America today. So the rest of this post is dedicated to the words that matter the most in this fight; the words of people of color. White friends? Share these words. The Civil Rights movement was not victorious. The assault on Civil Rights was successful. Trevor Noah, of course, is the host of The Daily Show and author of Born a Crime: Stories of a South African Childhood, which I highly recommend, particularly as an audio book, read by Trevor himself. Engaging. Fascinating. Deeply troubling. Humbling. Last week, Ijeoma Oluo honored Martin Luther King in King County, Washington which was originally named after former U.S. Vice President and slave owner William R. King and renamed for MLK in 2005. Ms. Oluo is the author of So You Want to Talk About Race. This is a portion of the transcript of her speech. In thinking of what it looks like to speak with truth and live in the love of the great Dr. King, ‘celebrate’ it not the word that comes to mind. When 25 percent of my brothers and sisters live below the federal poverty level in this county, in an area with one of the highest costs of living in this country, ‘celebrate’ is not the word that comes to mind. When black people make up 6 percent of our population and 44 percent of the population of our youth detention centers, ‘celebrate’ is not the word that comes to mind. When Hispanic and Latino people make up 9 percent of our population and 19 percent of our youth detention center population ‘celebrate’ is not the word that comes to mind. When Indigenous people make up less than 1 percent of our population and almost 6 percent of the population of our youth detention centers, ‘celebrate’ is not the word that comes to mind. When the average black household in King County makes just 35,000 dollars a year while the average white household in King County makes over 75,000 dollars a year, ‘celebrate’ is not the word that comes to mind. When 17 percent of Native Hawaiian and Pacific Islanders in King County who are expecting are lacking prenatal care, ‘celebrate’ is not the word that comes to mind. When 9 percent of indigenous people and 8 percent of black people who are expecting in King County are lacking in prenatal care, ‘celebrate’ is not the word that comes to mind applause. When the suspension and expulsion rate for black students in our schools is four times higher than white students, and two times higher for Latinos and Indigenous students than white students, ‘celebrate’ is not the word that comes to mind. When I see budgets to build new youth detention that far outweigh our budgets to reduce youth detention, ‘celebrate’ is not the word that comes to mind. When children of color make up one third of our child population, and over half of our population in foster care, ‘celebrate’ is not the word that comes to mind. And as I watch friend after friend, community member after community member, be pushed out of their homes and away from the safety, security, and resources of their community by gentrification — further solidifying all of the frightening statistics I just gave, ‘celebration’ is not a word that comes to mind. So no, as a county, as a society, as a country, I do not think we get to celebrate yet. So no, as a county, as a society, as a country, I do not think we get to celebrate yet. I do not think Dr. King would celebrate yet. So perhaps there’s another word, a word that I wish came up more often when I am asked to speak at these celebrations. Honor. What does it look like to honor Dr. King? What does it look like to honor his words that were chosen for today? “I believe that unarmed truth and unconditional love will have the final word in reality.” I have given truth. Truth that does not care about your excuses. Truth does not care about your complications. Truth that says that for over 400 years, our people have been abused. For over 400 years our children have not been allowed to be children. Truth that says that this country and this county has failed and is failing its people of color every day in countless ways. This is a truth that cannot be argued, a truth that must be reckoned with and accounted for. Austin Channing Brown is a leading new voice on racial justice, and author of I’m Still Here: Black Dignity in a World Made for Whiteness. Austin is committed to exploring the intersections of racial justice, faith and black womanhood. This weekend (MLK weekend), you’ll likely hear speeches, sermons, interviews etc that may be hard for you to process in the moment. Speeches about American racism, oppression and injustice that may be hard for you to not take personally or feel hurt by. You may be tempted to shut down, resist and block out every word because some words are difficult to receive. I encourage you to consider most Messengers have toiled over how to reveal truth and truths that help us to become The Beloved Community. You may be tempted to shut down, resist and block out every word because some words are difficult to receive… Where you feel challenged, lean in, ask questions, and wrestle to consider the merit of the truths they share. That is their motive — not hurting or disrespecting you. Where you feel challenged, lean in, ask questions, and wrestle to consider the merit of the truths they share. And I pray our strength, too. May love cast out all fear. Yes, all of this. As a mother and grandmother of white boys, I am painfully aware that other mothers and grandmothers have to teach their brown and black boys how to stay alive in a society that sees them as threats, as less-than, as criminals. This should not be how they have to teach their children, and I need to be intentional in leaning in and learning what I can do to change the world we all live in together.